The other day I heard a friend use the phrase to be blasted to the dark side of Pluto. Although I had never heard it before I immediately understood what might lie behind it. Pluto, the furthest planet (or sub-planet) in our solar system, is the astronomical equivalent of Timbuktu and Outer Mongolia, metaphors in this country for exotic, far and distant lands. And Pluto's dark side, furthest from the sun, must surely be the final, terrifying frontier between the known universe and the infinity beyond. The phrase immediately made me recall the images of Pluto we saw last month, thanks to NASA's New Horizons space probe. 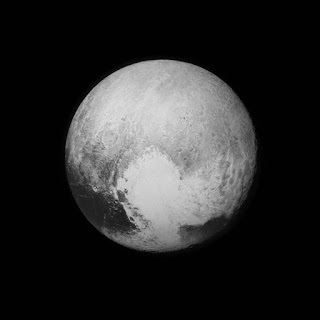 Much was made of Pluto's huge white heart, adding both beauty and personality to an otherwise frozen, inhospitable mass. Even the darkest side of Pluto has a heart - and a huge one at that! And it's a reminder, surely, that the love and imprint of the Heart of God are truly unbounded - reaching beyond even the darkest side of the coldest, furthest-flung ends of the known universe! That is so interesting. Thank you.